Today we are happy to announce a new version of our customer dashboard! We’ve cleaned up the dashboard so it’s faster and more efficient for you to use. Our mission is to help you become more productive and successful using Scale. In order to achieve this, we’ve redesigned our dashboard to better reflect how tasks are being completed with an overview of your project’s progress. Immediately, you’ll notice the new layout. The header has a new search input that allows you to search for tasks by ID on any page. Beside the header, you can manage your API keys (via Manage API Keys), making it easier to access your keys and quickly integrate Scale in your code. The sidebar navigation has direct access to the main sections (Overview, Tasks, and Payments) and Support (Chat & Documentation). We distributed our page’s elements more cleanly, and we updated the chart and the date filters as seen in the Overview. This is one of the most important features of our application, as this is where the detailed information about your tasks are shown. Here you will find the status and details of your tasks. You are also able to export the dataset and view the final result of a completed task. 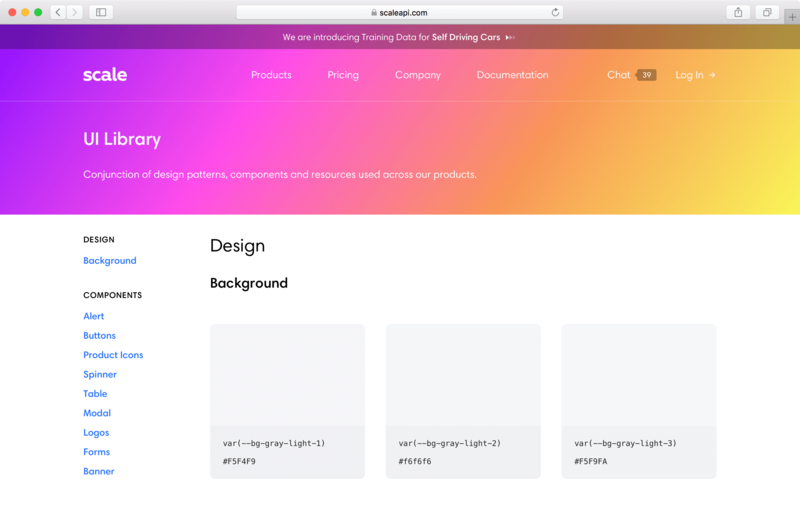 A year ago, we decided to move all of our frontend to Next.JS, making it possible to have our website, blog, scaler tooling, and dashboard all in the same stack. This helped us move faster while sharing and extending react components. In order to create more consistency, we have a UI library where all of our components are stored. At the time of starting the redesign of the dashboard, we had most of the components designed and implemented, so the process of creating the updated UI was smooth and fast. All of our CSS is written in styled-jsx with PostCSS plugin, meaning we only have a few lines of Global CSS. Our next steps in terms of frontend, are to implement Redux, to better handle different states of the UI, and continue updating our UI Library with more definitions in terms of: Typography, Backgrounds and Branding. Onboarding: By having our Onboarding tool be the first thing you see as you enter our site, we further our goal of helping developers quickly jump in and start using Scale. With this new feature, we show the decision makers at your company how our services can quickly and seamlessly begin improving your productivity. We are in the process of implementing this into our website as the final touches are being placed into our dashboard. Responsive Design We know it can be frustrating to check the status of your tasks without having the ability to on your handheld devices. While it wasn’t included in this release, we will support mobile devices in the very near future. Payment Model We are soon introducing a better way to experience Scale with a simpler pricing model that makes our rates clear to the user without any ambiguity or uncertainty. Stay Tuned. We know having a quick feedback loop is very important in order to achieve our mission of making our customers more produc__tive and comfortable using our product. Our improvements to the dashboard are meant to help our users quickly see how their projects and tasks are developing. We hope you enjoy our dashboard’s new and improved developments as much as we do! 😃 As always, we’d love to hear your comments and opinions.